I drive a lot, and lately I’ve been listening to Suze Orman Podcasts while I’m on the road. Suze often refers to one’s twenties and early thirties as “the compounding years,” because money saved in retirement accounts during these years will yield highly compounded dividends by the age of retirement. Don’t worry, this isn’t going to be a financial post. The term “compounding years” got me thinking about a different kind of equity we build in adulthood as a way to invest in our retirement future. Or at least the fact that we should be thinking of it in this way. That is, our health equity. In our twenties and early thirties, we work out and stay active maybe just as a way to look great, or beat personal bests, win sporting contests, or just to have fun. And while these may very well be reasons we work out in our late thirties and forties, it takes on a much greater weight (no pun intended). If we choose a sedentary or minimally active lifestyle while we’re young we may not be building muscle, but we’re not actively losing it either. And metabolism in your younger years usually hums along at a steady enough pace regardless. We are young and strong, with energy to carry us through even the most intense days. But that all changes when we hit our mid-thirties; muscle starts to waste, metabolism slows, and we begin to lose bone mass. Incrementally at first, then at an accelerating rate, until our bodies ultimately fail and we die. Such is life. The only way to slow the wasting and immobility that comes with age is to stay active. So while we may work out and be active in our thirties and forties as a way to look great, beat personal bests, win sporting contests, or just to have fun, we should also be thinking of these as our “compounding years” for health. The more healthy activity we can incorporate into our daily life in our mid-life, the more strength and vitality we will carry with us through our retirement years. And the good news is, just like it’s never too late to start investing money for retirement, it’s also never too late to start investing in your health. This entry was posted in Move Your Body and tagged Activity, Aging, Compound Interest, Exercise, Health, Health Equity, Healthy, Life, Retirement, Running, Suze Orman, Youth on February 16, 2015 by Angela Major. One of the highlights of this past summer was our family trip to Sunriver, Oregon in June for the Pacific Crest Weekend Sports Festival. I love this weekend because everyone has a chance to challenge themselves, and we all learn how to support and encourage one another. You never know what kind of weather you’ll get in Bend, but this year was beautiful! The sky was sunny and the air was warm every day. This did make for challenging running conditions later in the day, and also presented some additional diabetes-related considerations. We made sure to do extra blood sugar checks (before and after races) and keep lots of juice boxes, glucose tablets, and snacks on hand. Luke had one scary, almost-Glucagoned-him, very low blood sugar, but otherwise diabetes didn’t slow anyone down! I was planning to run the 10K this year, but the timing of the race was inconvenient, so I went ahead and signed up for the Half-Marathon instead. My longest run up to then had been about 7 miles, so I had no huge expectations for 13.1 miles, other than crossing the finish line. I surprised myself by running the majority of the race, and reveled in the accomplishment for the rest of the day! I’ll definitely run another Half in the future. This year was definitely the year for stepping up! Evie and Will, along with some of the other older kids, ran in the 5K race instead of the one-mile this year, and Jackson ran the 1-mile for the first time. I love to see them succeed when they challenge themselves, and it’s so good for their blossoming confidence to try new things, even when it’s tough! Our 5K runners….what a great group of kids! One of my other favorite things about this weekend is that we also have the opportunity to provide support and encouragement to athlete’s of all ages and skill levels on the race courses–our friends and family, as well as strangers. I know how energizing it is to pass people who cheer and yell for you during a tough run, and I’m happy to be able to pass that on! Once again, it was an awesome weekend, and I’m already looking forward to next year! This entry was posted in Move Your Body, Uncategorized and tagged Bend OR, Blood Sugar Checks, Community, Diabetes, Family, Friends, Glucagon, Half Marathon, Healthy, Hypoglycemia, Kids, Kids 5K, Kids Triathalon, Life, Pacific Crest Sports Festival, Running, Sunriver, T1D, Triathalon on September 25, 2013 by Angela Major. 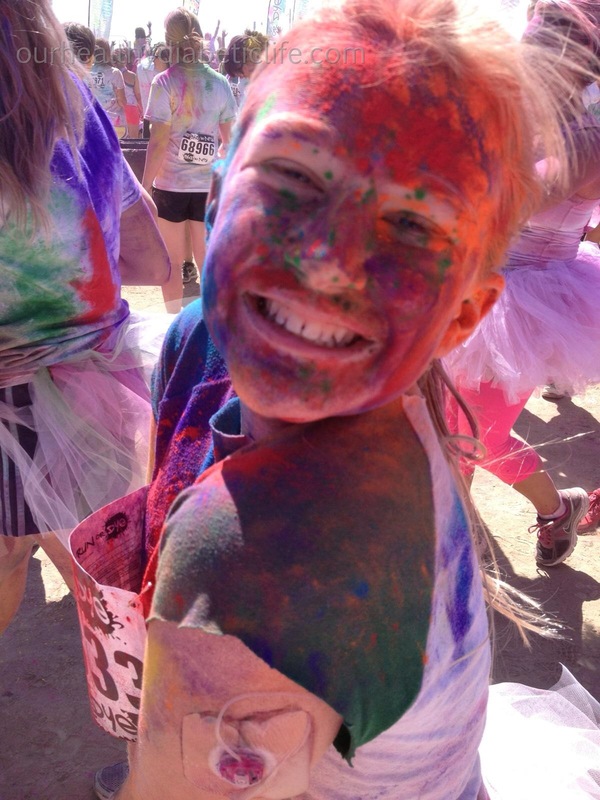 Evie ran in a color-splashed fun run yesterday with some friends who sent me this picture, which I love. Besides the expression of pure joy on her face, I am pleased to see that her pump site survived the run! Although it is even more colorful than usual. Good call on the IV3000, Evie. This entry was posted in Move Your Body, Type 1 Diabetes and tagged Diabetes, Fun Run, Healthy, Infusion Set, Insulin Pump, IV3000, Life, Run or Dye, Running, T1D, Technology on July 14, 2013 by Angela Major. I’ve had such fun running with my kids this spring! Will and Luke both surprised and humbled me by finishing a 5K fun run with me a few weeks ago, the longest distance either of them has run before outside of soccer practice. They enjoyed the attention they got by being the two youngest runners, and I was insanely proud of them! I knew beforehand that Will could run the distance, but I wasn’t sure about Luke. In fact, I hadn’t even planned to have him run, but he stepped up for his bib number without a second thought. I tucked the business parts of his blood sugar meter into his SPIbelt (which is how he wears his insulin pump), along with some glucose gel and meter strips, and we took off! Both boys ran about a mile before we had to slow to a walk for a bit. We all stopped again after the second mile for a quick blood sugar check (a little elevated but not worrisome), but Will took off on his own after that. Luke started to struggle a little in the third mile, but always managed to turn on the heat when someone was cheering him on or there was a photographer taking his picture! Will finished his run in just over 30 minutes; Luke and I crossed the finish line after about 45 minutes. We checked his blood sugar one more time and then bolused for his post-run snack. There’s always a worry during exercise that Luke’s body will chew through his blood glucose too fast and he’ll have a low. Having the tools with us to check for and treat a low blood sugar is non-negotiable! It was not only amazing to see my two small boys run a distance race, but to witness the pride and accomplishment that they felt within themselves at the finish line! And as icing on the cake, they won 1st and 2nd place in their age group (which I’m pretty sure was created on the spot). It’s so important to me that all three of my kids feel confidence in their physicality, whether they happen to have diabetes (Evie and Luke) or they don’t (Will). Running a distance race was a perfect way for them to safely feel what it’s like to push themselves towards a physical goal, and to learn that they can do more than they can imagine! This is a lesson that I learned late in life, and it pleases me to no end to see them learning how to enjoy being active now, when it can become a lifelong habit. This entry was posted in Move Your Body and tagged Blood Sugar Checks, Diabetes, Exercise, Family, Healthy, Kids, Life, Parenting, Running, T1D, Technology on April 5, 2013 by Angela Major. 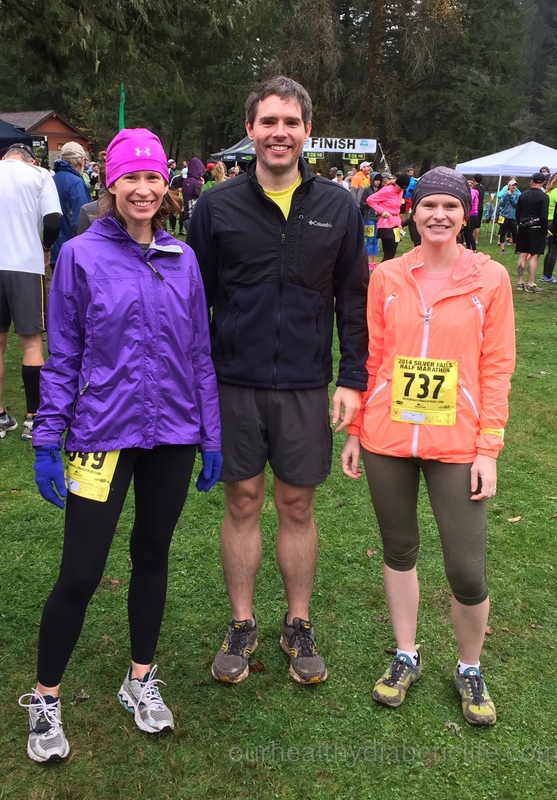 It’s Race Season….Run! Run! Run! After several months of holidays, busy schedules, and the resultant relaxation (no, the complete neglect) of my exercise habits, I’m feeling a little sluggish. In the past few years I have maintained a healthy level of fitness and activity through yoga, hiking, running, and whatever else I can grab time for. Physical activity, more than anything else in my life, keeps my mind clear and focused, my emotions steady, and my body strong and healthy. Which all make me a better mom, better partner, better friend….a better woman in general! So we’ve rolled over into a new year, and are rounding the corner on winter. I’m craving some exercise and the pick-me-up that comes with it. Spring will bring sunnier days and warmer temperatures and….race season! I just started running a couple of years ago with the encouragement of my sister, Kate, a marathoner. She’s inspirational in her own running and I’ve had so much fun racing with her! And she’s not afraid to yell “Tie that shoe Angie!! !” in the middle of a course. Just like Kate has passed her love of running on to me, I aspire to instill the same feeling of excitement about fitness in my kids. Evie has participated in three seasons of Girls On The Run, a great program that builds confidence and love of fitness in grade-school girls. She and I have run three 5K races together as part of that program! I’ve been delighted to run together and encourage her, and to see the pride on her face when she completes a race and improves her time. Left: Evie and one of her Girls On The Run pals after their Spring 5K. Right: Evie’s very first GOTR 5K. Will and Luke provided moral support and comic relief. We participated in the weekend-long Pacific Crest Sports Festival last summer in Sunriver, Oregon, and Evie, Will, and Luke got a taste of the triathalon world. They each rocked the Kids’ Splash, Pedal, and Dash, and Will finished with an impressive 6:49 (that’s minutes). We hung around transition areas and cheered. We watched athletes claw their way to the finish of a challenging triathalon course and then break out in laughter and smiles at the accomplishment! And in our downtime we rode miles and miles of paved and unpaved bike trails through the gorgeous Deschutes National Forest (Bonus!). Left: Luke, Evie, Will (and cousin Ella) at the mini-tri bike transition. Right: Post-race smiles, and medals all around. The very, very best thing about this particular festival is that it serves to generate excitement for fitness in the whole family. Kids run, moms run, dads run, friends run, strangers run (and bike and swim! ), and everybody has a great time! Emphasis is on personal best and finishing, not winning, and everyone’s efforts are recognized. Our group had racers in both triathalon events, the half-marathon, 10K, and kids’ races, and everybody’s finishes were celebrated wholeheartedly. I honestly can’t think of a better way to make fitness fun and to model that health is important and valuable. Left: Luke, Evie, and Will after their 1-Mile Dash finish. Right: Luke was especially proud of his race medal, and has since permanently affixed it to his school backpack. So I’ve set a goal for 2013: I will run a 10K race in under an hour. I only have one 10K time under my belt for reference, but I think it’s doable. I have one race lined up for April, and I’m anticipating a second chance in June. In the meantime, I’ve got to get running! What activities excite you and make you want to get moving? Please share! This entry was posted in Move Your Body and tagged 10K, Bend OR, Community, Family, Fitness, Friends, Girls On The Run, Healthy, Healthy Living, Kids, Life, Pacific Crest Sports Festival, Parenting, Race, Running, Sunriver, Triathalon on February 15, 2013 by Angela Major.